The Sustainable Demographic Dividend contends that the long-term fortunes of the modern economy rise and fall with the family. 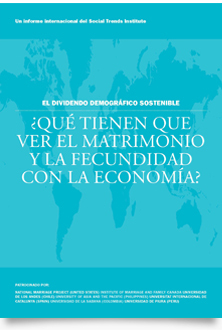 The report focuses on the key roles marriage and fertility play in sustaining long-term economic growth, the viability of the welfare state, the size and quality of the workforce, and the profitability of large sectors of the modern economy. WHY DO MARRIAGE AND FERTILITY MATTER? 1. Children raised in intact, married families are more likely to acquire the human and social capital they need to become well-adjusted, productive workers. 3. Nations wishing to enjoy robust long-term economic growth and viable welfare states must maintain sustainable fertility rates of at least two children per woman. likely to profit when men and women marry and have children. 1. Companies should use their cultural influence to get behind positive, family-friendly advertisements and public education campaigns. 2. Countries should increase access to affordable health care and lifelong learning to strengthen the economic foundations of family life. generous tax credits to parents with children in the home. 4. Corporate and public policy should honor the work-family ideals of all women by giving families the flexibility to pursue their own preferences for juggling work and family. The bottom-line message of The Sustainable Demographic Dividend is that business, government, civil society, and ordinary citizens would do well to strengthen the family—in part because the wealth of nations, and the performance of large sectors of the modern economy, is tied to the fortunes of the family.